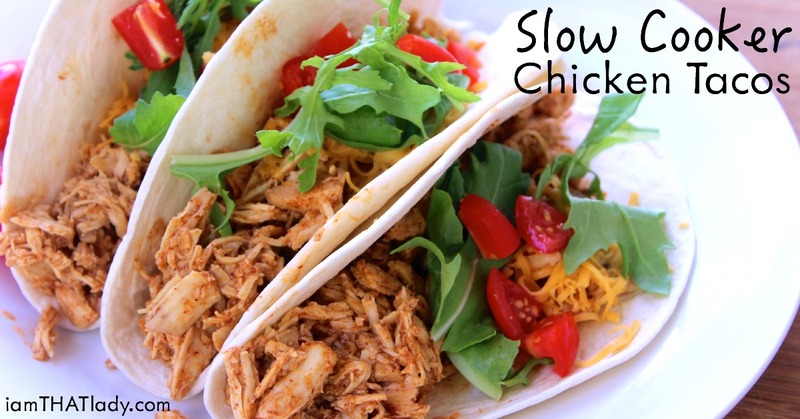 The BEST Slow Cooker Chicken Tacos | Easy, Delicious, & Healthy! Taco night will look different at our house from now on. 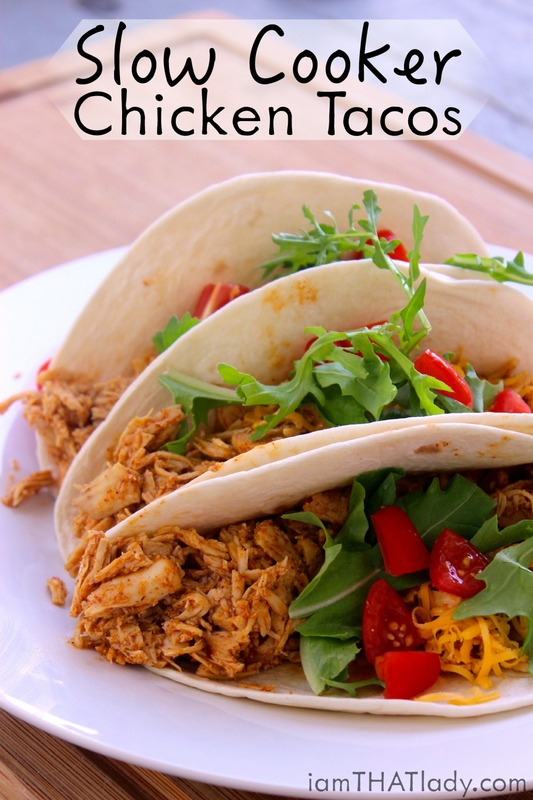 Once I made these Slow Cooker Chicken Tacos, I don't know if I can go back to the normal way of using ground beef… and that's hard for me to say because I would usually prefer beef over chicken every time. 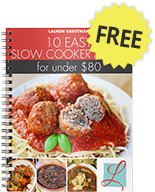 This recipe is part of an AMAZING slow cooker dump meal plan! 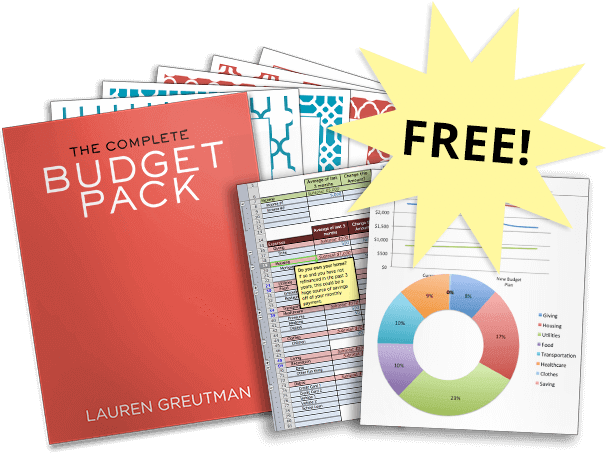 These are WAY easier for me – and according to my kids, they taste WAY better. No need to use a seasoning mix pack with this – just 4 spices plus salt. Simply toss in 2-3 chicken breasts (about 1-1.5 pounds). I cut mine into chunks so they would cook faster. Then put all the other ingredients on top. 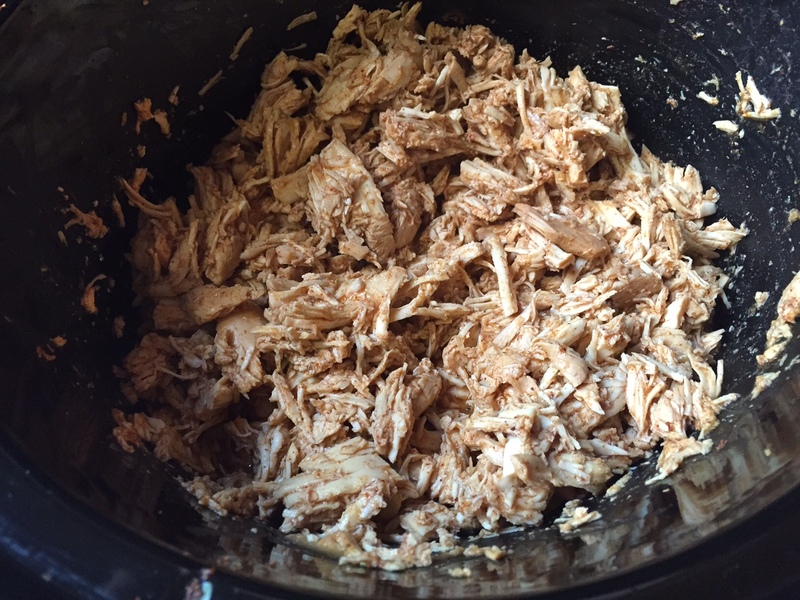 Cook on high in your slow cooker for 4 hours, and then you're ready to shred the chicken! At this point, the chicken will just fall apart and shred pretty easily. You can use forks, or a potato masher. Serve in either soft or hardshell, and then top as you normally would! This also would work AMAZING for freezer cooking. Just toss all the ingredients in a freezer bag to cook at a later date. It’s soooooo good!!!! Make it tonight! Great recipe! I’m glad I found it! 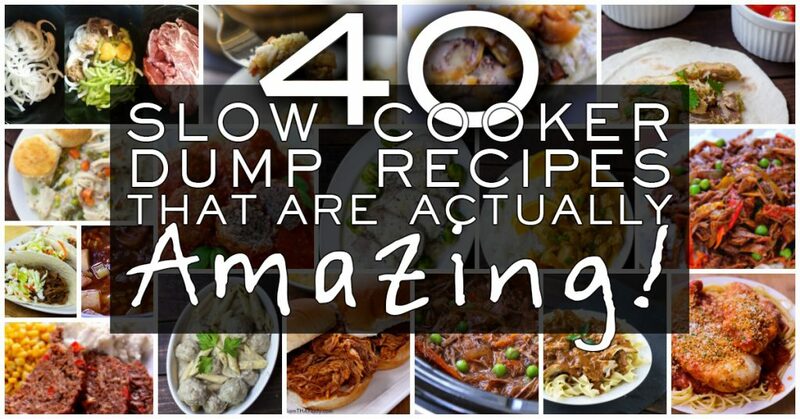 However, the cooking time will depend on your crock pot. I cooked the chicken on low for 8 hrs like the recipe says and it came out dry. I added olive oil, though, and my guests still devoured it. The second time I cooked on low for 6 hrs and it was better, but probably could still cook for less time. I’ll try five hours on low next time. Also, I used sazon seasoning, common in latin american cooking. The recipe calls for the chicken breasts to be cook on high for 4 hours. I’m making this recipe today but have a question. Do you need 1 cup of chicken broth for the 1 chicken cube plus a 1/2 cup of water as well? Or just 1/2 cup of chicken broth (1 cube + 1 cup of water makes 1 cup of broth)? Please let me know ASAP, thanks!! Just the chicken broth. It’s either 1 or the other. I would double it for that amount of people. Are the Aldi boullion cubes really gluten free? Most aren’t, and I’m just curious. Hello Lauren. 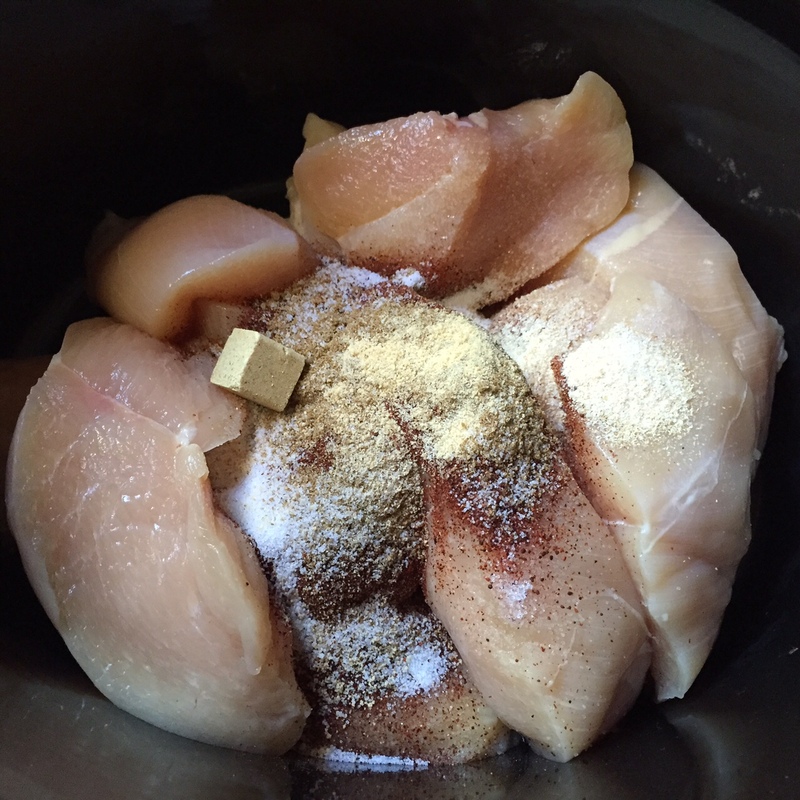 I am ready to put this together – I’ve got my chicken in the pot, however, I bought 3 chicken breasts as you suggest but it turned out to be 3.5 lbs. How do you recommend I increase the spices? Double? Triple? Let me know as soon as you can – otherwise I’ll have to wing it. Thanks! I made this last night and used a 3 lb bag of frozen chicken breasts, and doubled all the other ingredients. Turned out great! Hi Lauren, made this a couple weeks ago in the crock pot and it was excellent. Any suggestions on timing for doing it in the Instant Pot? Would this be mild or spicy? My kids don’t love when it’s too spicy. Thanks! Can’t wair to try! I’m trying to figure out if Aldi’s Pueblo Lindo White Corn Tortillas are gluten free. Can any one help? I made these for a party i’m Having and they don’t taste good. They taste like chili powder. Very disappointed!! Disgusting. I don’t know what people are talking about if they say they are good unless they are friends of the person with the blog. Hello Lauren, I doubled the recipe and there was too much liquid so that there ended up being no flavoring on the chicken. I used 6 chicken breasts so I doubled the ingredients. any recommendations? I would like to try them again. thanks.